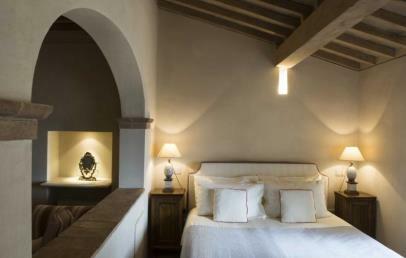 The Castello di Velona Resort, Thermal SPA & Winery stands in the heart of Val d'Orcia, only 10 km away from Montalcino. 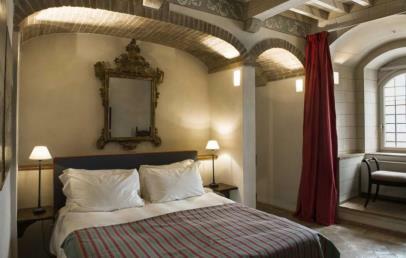 Obviously, its original nature of castle still keeps its charm and enjoys a panoramic position among the hills of Siena. 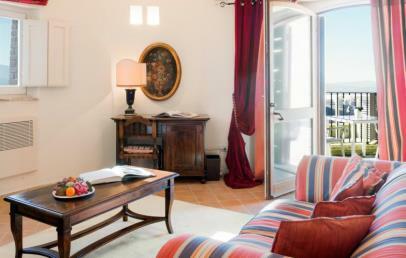 It is surrounded by oak woods, olive groves, vineyards and ancient and interesting villages. A break in the idyllic resort of Velona is ideal for guests who seek authenticity, spontaneity and a contact with nature and wine production, but do not deny themselves the opportunity to engage in cultural activities or sports. After several acquisitions and successions, the medieval fortress reborn thanks to an extended expansion and restoration project. 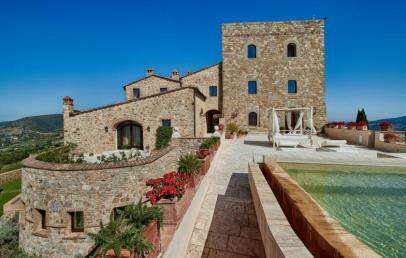 Today, the Castello di Velona has been turned into a luxury hotel of great cultural appeal. This magical place consists of the oldest part, a watchtower dated in the 12th Century, the main loggia from the high Renaissance while the rear was built in later times according to neo-medieval design. Inviting and refined rooms and suite, where history’s charm blends with modern design and comfort such as the restaurant with panoramic terrace, the outdoor swimming pool with Jacuzzi and a SPA, set over an area of over 1500 sqm. 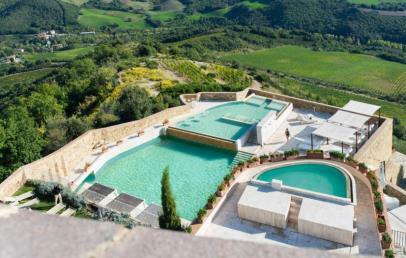 Castello di Velona Resort, Thermal SPA & Winery conists of 46 guest rooms and suites which offer a panoramic view of the Val d 'Orcia and Tuscan vineyards. 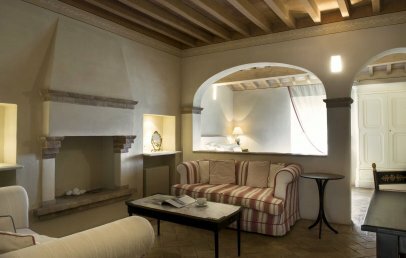 Furnished with period furniture, antiques and prized fabrics and materials, are located between the "Castle" and the new "Spa & Terrace" areas. 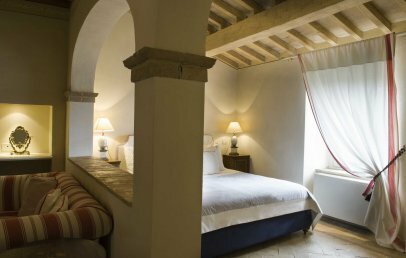 You can choose between different types of Castle rooms and suites, characterized by hand-made decorative motifs and paintings of different colour shades combine with the warm hues of fabrics and furnishings. 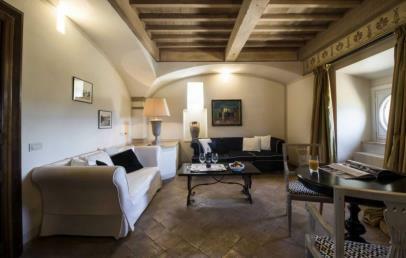 They aare all warm and cosy with exposed beams, vaulted ceilings, terracotta tile floors and large decorative fireplaces. For Spa lovers clients can choose the Rooms and Suites of the new "Spa & Terrace" area, with a linear and contemporary design and travertine material while the bathrooms are characterized by large, hot spring baths. The beautiful OLI SPA sets over an area of over 1500 m2 and consists of is equipped with two outdoor Spa pools (one of them is always equipped with hydromassage), five treatment rooms, one room for couples treatment, a Turkish bath, a sauna and sensory showers. The therapeutic properties of the SPA are guaranteed by the hot spring water which that reaches a temperature of 50° and can be described as "hyper-termal". Rich in mineral salts deals with sodium bicarbonate, sulphate, calcium, magnesium, the SPA offers unique wellness experience for its guests. You may take care of yourself thanks to a range of treatments (face and body) performed by a professional staff carried out utilising natural preparations made from local products, based on grapes and olive oil. 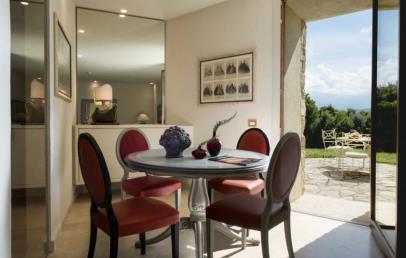 The flavours and tastes of the most refined regional Italian cuisine are served in the panoramic terraces of the Castello di Velona Resort, Thermal SPA & Winery. The young and talented Chef aims at revisiting Tuscany’s traditional recipes which are accompanied with a significant wine menu featuring Brunello di Montalcino. You can choose between the Velona Lounge Bar and the Gourmet Restaurant "Settimo Senso", while for light and small snacks ist the Pool Bar available. Guests of the Castello di Velona Resort, Thermal SPA & Winery can enjoy the outdoor Jacuzzi pool or sunbath in the equipped poolside. Guests can book an excursion on horseback or mountain bike, or go on a tour of the wineries, truffle hunting or take a cooking lesson. In addition you may rent a sport car to visit the surroundings. 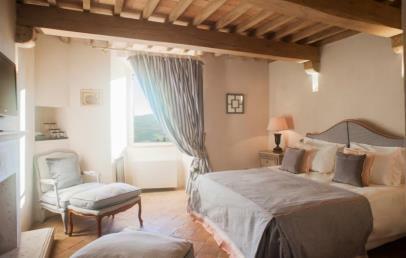 City tax – The municipality of Montalcino requires € 3,50 per person/overnight for the first consecutive 4 overnights, to be paid on-site. Children under 12 years and person with disabilities are exempted. 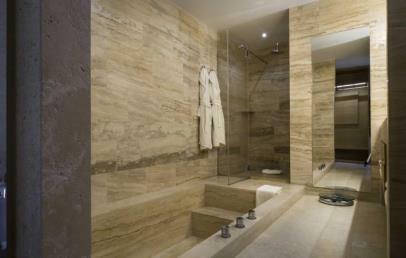 The marble bathroom features a bath with shower or bathtub and single washbasin. 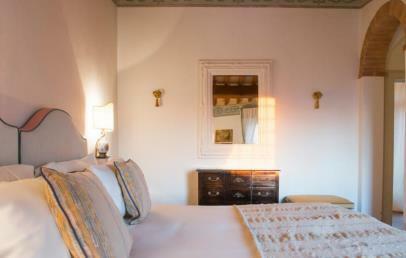 The Castle Family Suites have double beds with slatted base double bed and high comfort mattress. They are located in the castle area and are characterized by exposed beams, vaulted ceilings, terracotta tile floors and by a large decorative fireplaces. 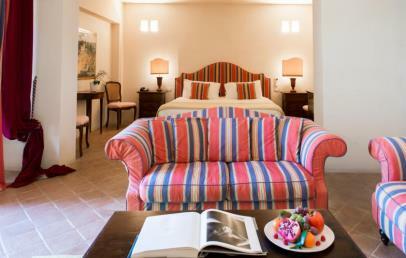 Each rooms is elegantly and stylishly decorated with an armchair, a breakfast table and/or a desk and a coffee set. 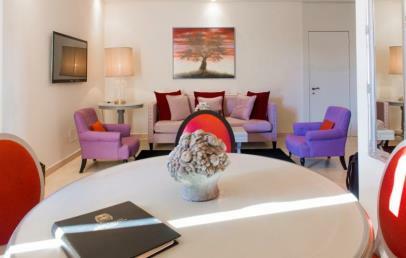 The living room is equipped with armchairs and comfortable sofa. 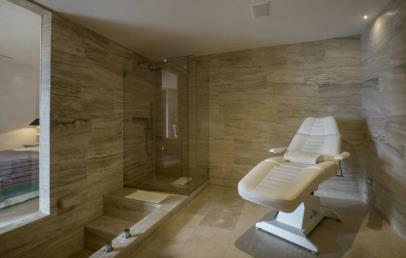 The marble-finished bathrooms are equipped with bathtub or shower and a single or double washbasin. 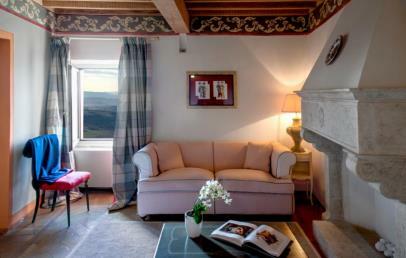 The Castle Family Suites overlook the Valley of "Orcia" and the vineyards surrounding the castle. 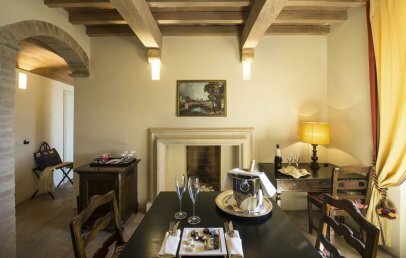 TheCastle Balcony Suites feature classic and traditional furnishings with terracotta tile floors, vault ceilings and exposed beams. They measure between 30 sq. and 50 sq. 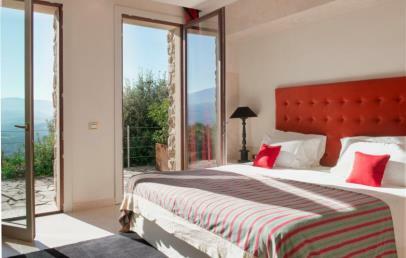 and have a large living area separated from the bedroom plus a private balcony overlooking the Val d’Orcia and the Castello di Velona’s Brunello vineyard with its breathtaking sunsets. 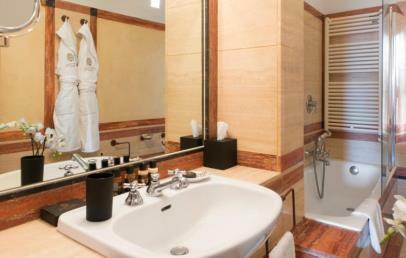 The marble bathrooms are equipped with bathtub and shower, some have a jacuzzi. 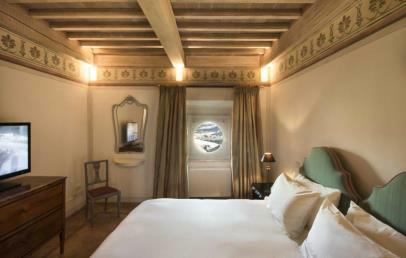 All accommodation feature Wide-screen TV, minimum 32”. 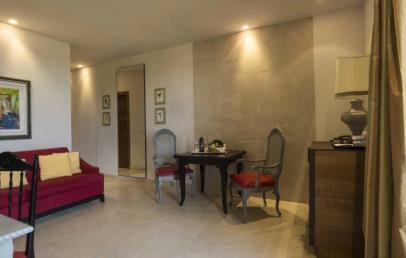 The Castle Suites are elegant and finely furnished and feature a large living area separated from the bedroom for the utmost comfort. 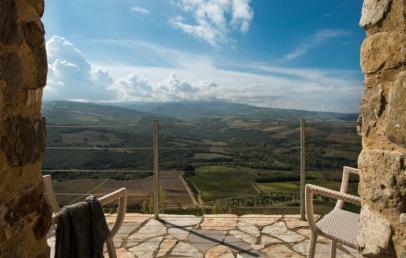 Some feature a beautiful view over the Val d’Orcia and fireplace. They measure from 26 sq. to 42 sq. 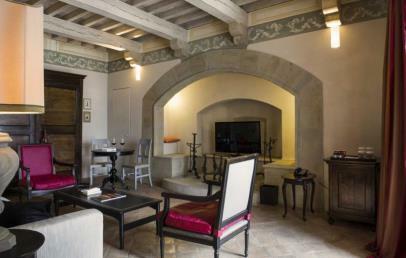 and are located in the old part of the Castle giving the unique feeling of the original architectural features such as terracotta tiled floors, vault ceilings and exposed beams together with additional contemporary and modern furnishing for a luxury touch. 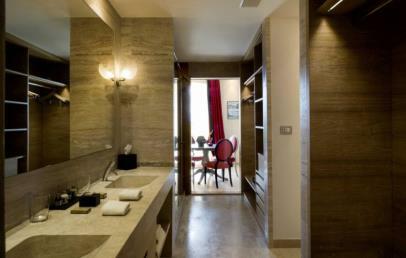 The marble bathrooms are equipped with bathtub or shower and a single basin. 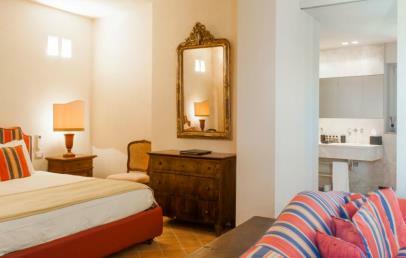 All accommodation feature Wide-screen TV, minimum 32”. Located on the ground floor of the Ancient South Tower of the Castle with a large private terrace of 150 square meters, (equipped with: canopy, large stone table and chairs, 2 comfortable sun loungers and umbrella) overlooking the vineyards of the Val d'Orcia and equipped with a large pool of pure hot volcanic water for unforgettable moments both in summer and winter with the best 180 ° view of Tuscany. 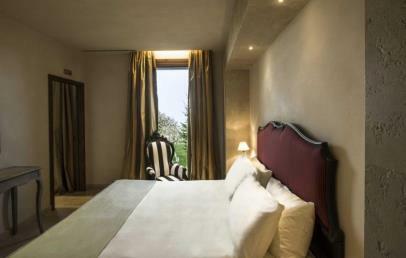 The elegant interiors are divided between the sleeping area and the large living room. 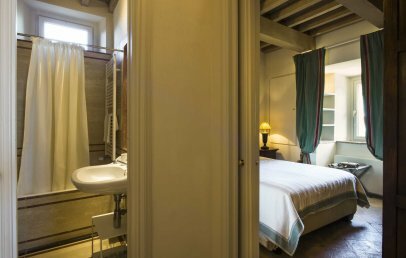 Florentine terracotta tiles, large historical decorative fireplace, ceilings with exposed beams, panoramic windows set in the thick walls, classic decorations and stylish furnishings invite you to relive the emotions of an ancient history. 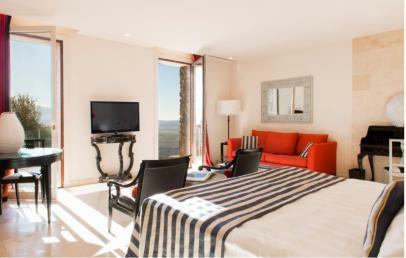 The Unesco View Terrace Suite (45 sq.) 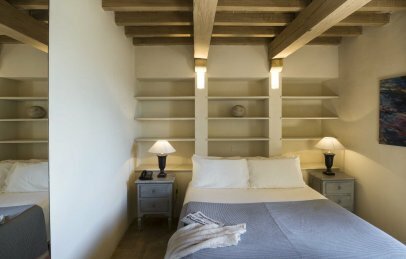 are located in the contemporary and modern wing of the Castello di Velona and feature a bedroom separated from the living room decorated in a contemporary style with delicate and warm colors inspired by the Tuscan tradition. Elegant and spacious the Unesco View Terrace Royal Suite, has a spacious bedroom with a beautiful view of the vineyards of the Val D'Orcia, separated from the living room by a large sofa, armchairs, desk, table and chairs furnished with soft colors and a linear and contemporary style, with warm references to Tuscan tradition and French window overlooking the Val D'Orcia. It also has a separate room to receive relaxation treatments, is equipped with a professional massage bed and separate entrance to the Spa Therapist. 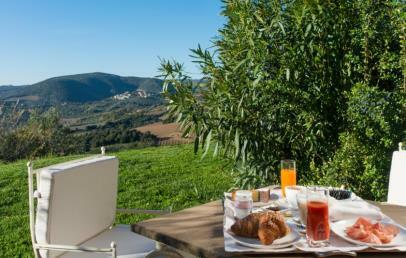 From the private patio and garden, equipped with table, chairs and sun loungers and large umbrella you can admire a wonderful landscape on the vineyards and the World Heritage Site and on Mount Amiata, in particular the unforgettable sunsets over the Val d'Orcia and the vineyards of Brunello di Montalcino. Possibility of organizing exclusive dinners. 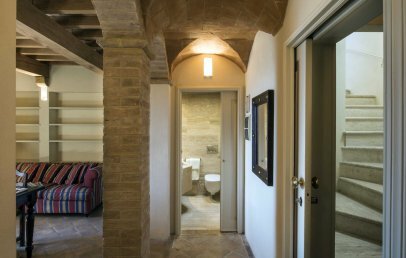 The bathroom, with spacious walk-in closet, is entirely in travertine and equipped with a large bathtub that you can fill with the same volcanic water that feeds the baths of the SPA, separate shower and double sink in travertine monoblock, separate bathrooms. 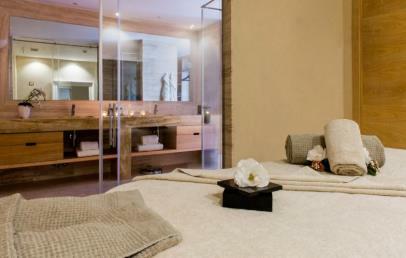 Access to the Oli Spa and to the Thermal Pools included!